Repetition and practice are often all that are needed to bring about an improved outcome with just about any task. This includes pushing a lawnmower (my kids get better at it with each passing summer), swinging a golf club or tennis racquet, or paring & sawing right to your marked line. Practice and experience, along with a little sheer will power thrown in, propel our species to get better at doing the things we do. Yet try as we may, oftentimes we can find ourselves at a place where we just get “stuck.” The road to improvement may be right in front of us, but we cannot see the path. Fortunately during these “stuck moments,” sometimes all it takes is a person with a more skillful and practiced eye to share just the simplest of feedback, which then enables us to move forward. Duffers experience this when a golf pro points out the tiniest of adjustment to one’s golf club grip and voilà, the dam holding you back from hitting a nice straight drive suddenly bursts. The other day I had one of these moments using a Tormek Sharpener and it involved the task of stropping the backs of chisels on the leather wheel. Though stropping a chisel’s bevel on the Tormek can be done using the tool guide bar & the Square Edge Jig for perfect positioning, stropping the back of the chisel is a “freehand” operation, which for me personally meant “the liberty and freedom to screw it up.” The 8­-1/2” diameter stropping wheel gives a good amount of open access to the wheel’s circumference (face). So much so that I was presenting the back of the chisel to the stropping wheel in haphazard random places along the wheel (but hey, I was consistent in my randomness) and thus getting predictable, lackluster honing results because I was slightly “rounding” the edge on the back side of the chisel. Because of this, I had resorted to using a manual flat strop in order to avoid my “rounding errors” when stropping on the wheel. Of course an easy solution to allow me to hone the chisel back correctly on the wheel was right in front of me, but I was not seeing it. However, once it was pointed out to me, my personal log jam keeping me from stropping successfully on the wheel was joyfully breached. Turns out the carrying handle on top of the Large Tormek Sharpeners, models T-7 & T-8, is a perfect visual reference for highlighting a center line point at the top of the wheel. At that intersecting point on the wheel, when you draw the chisel back so the end is at that tangent point on the wheel and with the chisel being held level, the back will be flat on top of the wheel, and the honing will happen on the back, right at the cutting edge, and in the “flattest” manner possible. 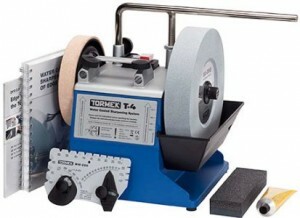 And it just so happens the T­4 model sharpener has a line in the casting that serves as the same visual reference. I don’t know why I couldn’t see what now seems obvious, or couldn’t figure it out without having to be shown, even after sharpening a good number of chisels. (My hat goes off to “Stig,” the Swedish “Tormek” race car driver, for showing me the glaringly obvious among the merely obvious). I do know this won’t be the last time something appears to be staring me in the face which I cannot see. Yet in the big scheme of things there could be worst things to overlook. I could miss seeing a MARTA bus speeding by as I step off the curb to cross the road or overlook the fact that I am in fact being stubborn when my spouse calls me so. But for now, I remain “unstuck,” in good health, happily married, and now able to put finely honed edges onto my chisels. Tormek 2006 Supergrind Sharpener Special!